NEIP Hosts First Annual Exoneree Picnic! 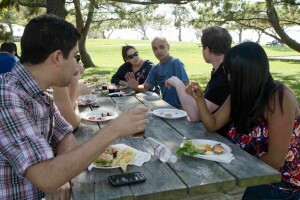 NEIP hosted a picnic for New England exonerees and their families Monday, October 10th on George’s Island in Boston. Four New England exonerees and their families joined current and former NEIP staff for a day of food, games and discussion. This is the first time that exonerees from New England have had the chance to come together in New England and share their experiences with each other and their families. Exonerees in attendance included Bernard Baran, Scott Hornoff, Dennis Maher and Anthony Powell, who spent a combined 56 years in prison for crimes they did not commit. The event was designed to give exonerees the chance to discuss their struggles and successes adjusting to life after being freed from prison. Clockwise from top right: Scott Hornoff passes the frisbee to Dennis Maher’s daughter Aliza. Bernard Baran (center, blue shirt) speaks to a group of NEIP staff. Anthony Powell (white shirt) with NEIP Executive Director Gretchen Bennett (navy blue shirt). Scott Hornoff’s daughter Abbie performs in front of NEIP staff. Dennis Maher and his son Josh enjoy the ferry ride to George’s Island.